Sweet, savory and nutritious in a bowl. This chicken salad is packed with flavor and perfect for a well-rounded meal of chicken, avocado and more of your favorites. Separate along the line of the chicken breast to obtain two equal parts. With a sharp knife, being very careful, slice each fillet in half width-wise to obtain two thin slices. On medium-high heat, in a large fry pan, heat 2 tablespoons of olive oil. Add the 4 slices of breast fillets and quickly brown them on both sides until golden. Add the onion and then sprinkle the mixture—chicken included—with one teaspoon of All Purpose Bouillon & Seasoning Granules. Sauté for a couple of minutes. Move to a bowl. Add the almonds to the same pan and sauté until golden. Add to the chicken and onion. Make dressing by placing in a jar 1 teaspoon of All Purpose Bouillon & Seasoning Granules, the lemon juice, the remaining 2 tablespoons of olive oil and also the honey. Close the jar and shake well. 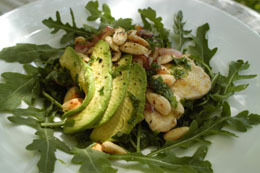 Arrange all of the lettuce on serving plate or bowl, top with the chicken slices, onion, avocado and almonds. Pour the dressing all around and serve with crusty bread (or crusty gluten-free bread).